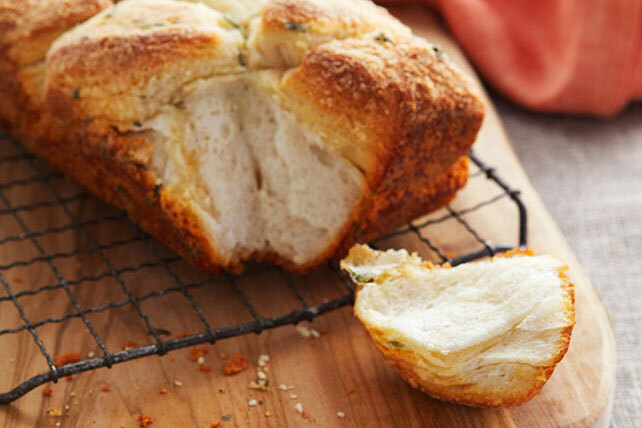 Serve this Parmesan-Herb Bread Recipe to please the family. They don't need to know it took 15 minutes to put together this Parmesan-Herb Bread Recipe. Spray 9x5-inch loaf pan with cooking spray. Mix cheese and oregano in medium bowl until well blended. Dip biscuit pieces, 1 at a time, in butter, then in cheese mixture, turning to evenly coat each piece. Place in prepared pan. Bake 25 to 30 min. or until golden brown. Cool 10 min. ; remove from pan to wire rack. Cool slightly. Substitute fresh dill for the oregano.